Potosi, again is given a chance to fight pollution!! Potosi has been created along with mining. Back when I was working for an international development organization, I had a peculiar disappointment. To make the story short, we proved those mining mills they were throwing to the river around $20K in bad mix of minerals, excessive use of chemicals to do the milling job and in sum, we offered a solution to a zero or close to zero cost. And what happened??? none of those “entrepreneurs” did want to engage in the project. Most of them thought we were coming to “steal” their incredible technology, which is pretty much the same old stuff that all of them use. Back in that time they were just happy with the idea that JICA had offered to fund a greater portion of the water ponds down the stream to treat the water against all the pollutants of their production. It was useless to tell them that said project was going to be cheaper if they engage in our clean/sustainable/free project!! 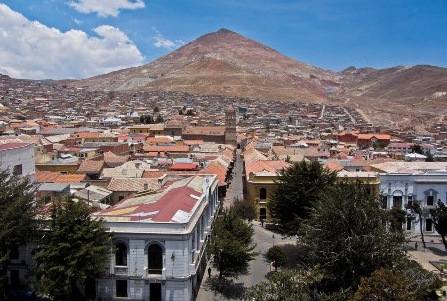 It’s been called “The Mountain That Eats Men.” Towering above the small Bolivian town of Potosí is a peak that has wrought human and environmental destruction for centuries because of the precious metals buried under the soil and stones. All those years of extracting silver and zinc, among other precious commodities, have heavily contaminated the local drinking water with a toxic cocktail of roughly 161 tons of zinc, 157 tons of iron and more than two tons of arsenic per year, the folks over at Txchnologist report. The picture is certainly bleak. But there’s some hope: University of Oklahoma researchers are piloting a relatively inexpensive and natural clean up process to turn the toxic sludge into water usable for crop irrigation. The project stands in stark contrast to typical bank-busting chemical and electric process that clean wastewater like the runoff from the Potosí mines. Using a tiered system of collection pools, each tailored with minerals or organisms that help along the cleaning process, the system slowly pulls out the contaminants using clay, limestone, and organic compost. The water passes through a final wetlands area to filter out any large physical particles before it is ready for agricultural use. With $75,000 and minimal energy needs that can be met with solar panels, the pilot project has successfully turned rust-colored wastewater clear.